It's Friday once again...and that means it is time for you to vote on your favorite boy's look. Scroll down to see all five designs and then you can cast your vote in the left-hand sidebar. (If you are on a mobile device, you will need to click "see full web version.") We will be back on Monday with the total of your voting (about 50 %) and the judges' scores (about 50 %). Good luck designers!!!!! Your looks are once again astoundingly well-done!!! 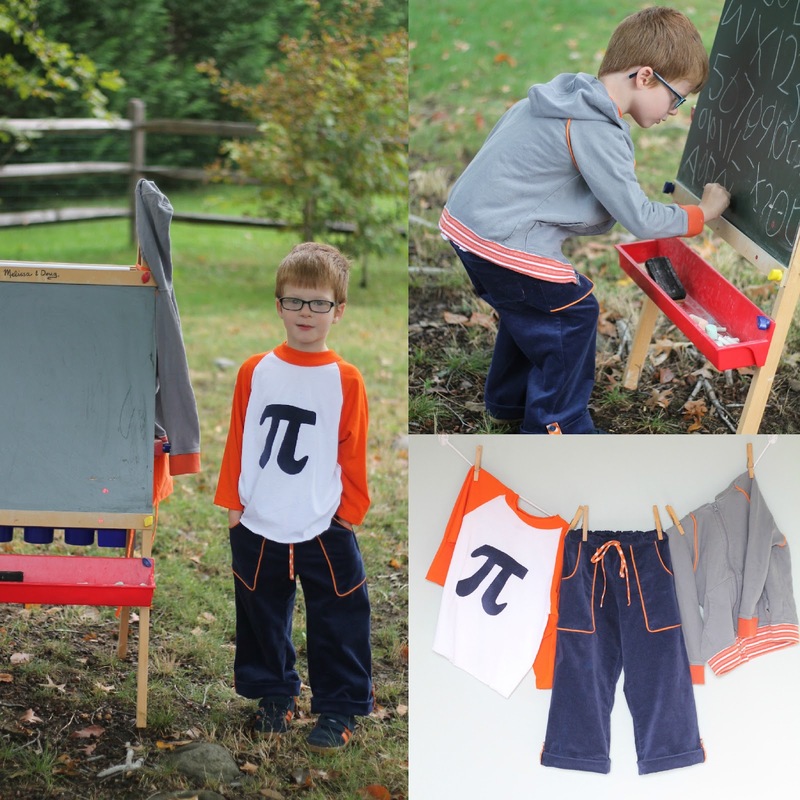 I love sewing for my boy. In my opinion, there just aren't enough options for cool boys clothes out there among commercial patterns or in stores, so I'm super passionate about customizing his wardrobe with garments that are one-of-a-kind. 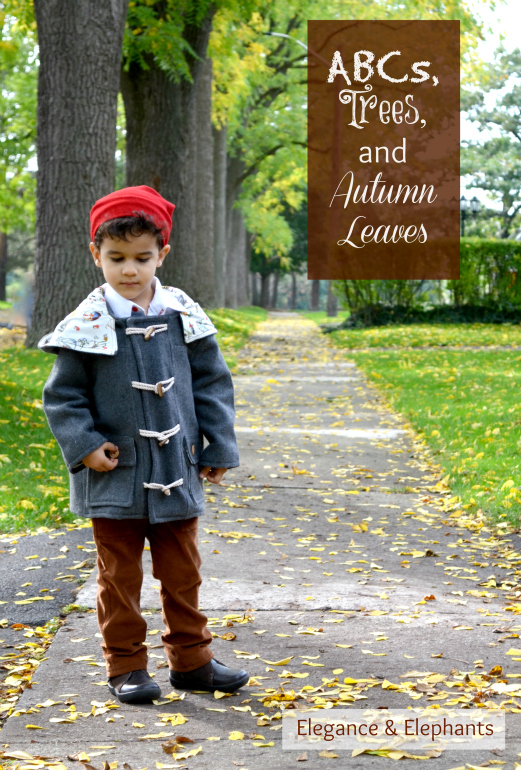 This outfit was inspired by the beautiful season of autumn and it's warm colours. The duffle coat is made of a wool blend, and features toggle button closure, deep front flap pockets, and flat felt seam finishing throughout. 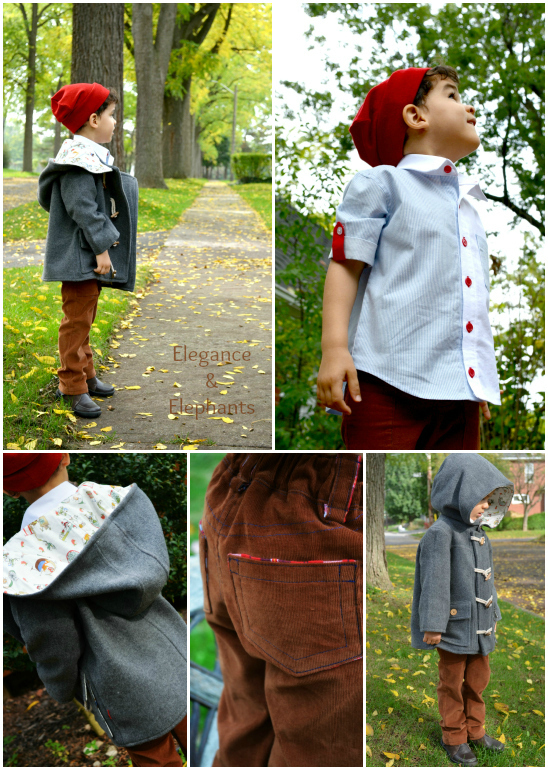 It is fully lined with a fun, ABC Maypole Buddies fabric. The hood has a front button closure for added warmth. The shirt has solid and striped piecing and roll up sleeves with contrasting buttons tabs. I accented the slim-cut, toffee wale corduroy trousers with plaid fabric in the pockets, and belt loops. It has a functional zip-fly, adjustable waistband, and contrast royal blue stitching. I added a stylish, bright red, slouch toque (aka beanie) that was made from some leftover sweater knit I found in my stash. 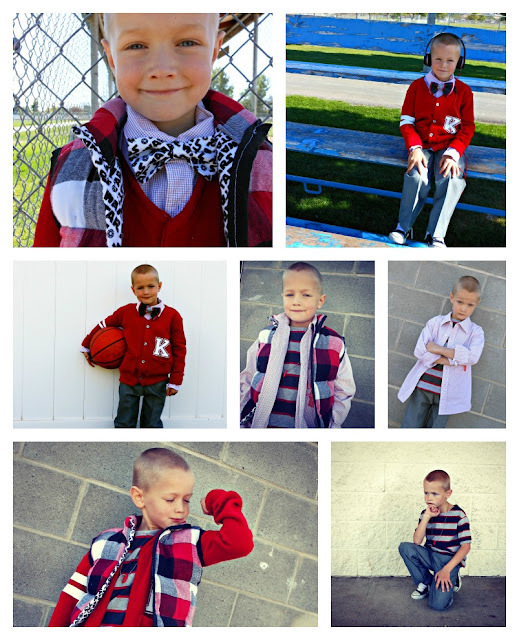 There are many more photos and details at Elegance & Elephants, so come stop by! And what says autumn more than corduroy? 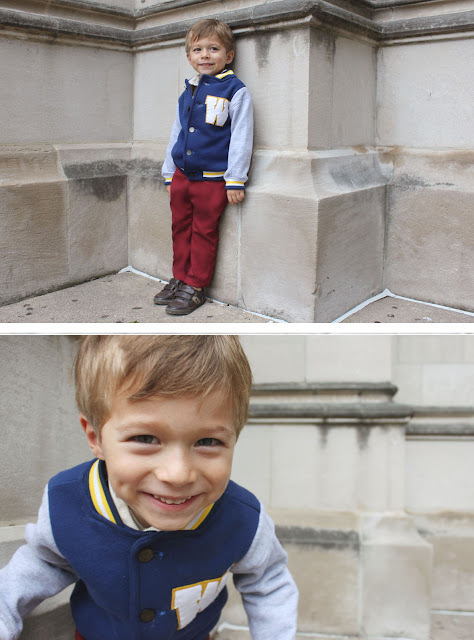 I made my four year old, Reid, a nice warm pair of fully knit lined corduroy pants and a cozy corduroy jacket to match. 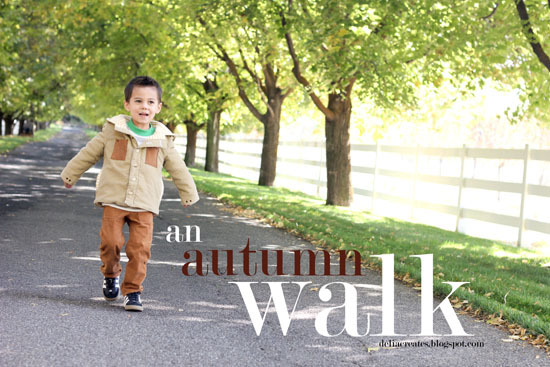 The jacket is lined with fleece hidden behind another layer of soft yellow striped cotton. It has working welt pockets at the sides, leather pockets in the front, a warm hood, and big wooden look buttons that close it all up. Underneath you'll find a super buttery soft striped knit shirt with contrasting green ribbing at the neck and wrists. Each piece has little details. The shirt has a faux pocket embroidered on the front (along with a love note from me on the back). The jacket has little metal eyelet punches adorned throughout and the pants have fun pearl snaps at the waist and back pockets. To get a better look at these details, to find out how I made each piece, and for loads more pictures come to my blog: deliacreates.blogspot.com! 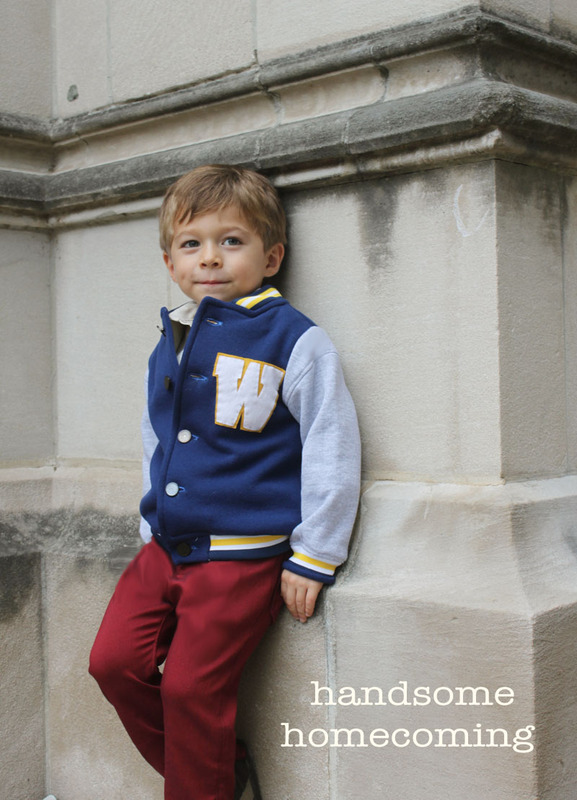 For this weeks boy challenge I decided to make something appropriate for my little guy's return to school- new dress duds fit for picture day and his very own letterman jacket. 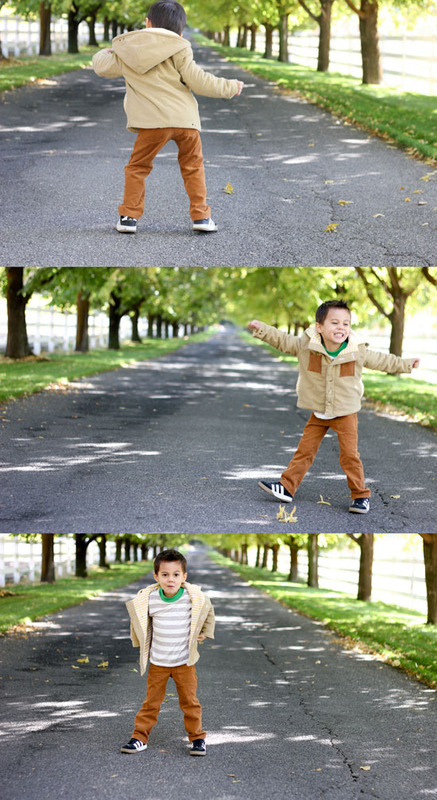 The jacket was made with sweatshirt fleece and it is set to become his new go to when running out the door. The dress shirt is made from a bed linen with faint yellow stripes, and the pants are a stretchy red suiting material that look perfect dressed up or down. I liked the idea of this project being modern with the bold colors, but still nostalgic and whimsical with the child sized varsity gear. Check out my blog for more pictures! 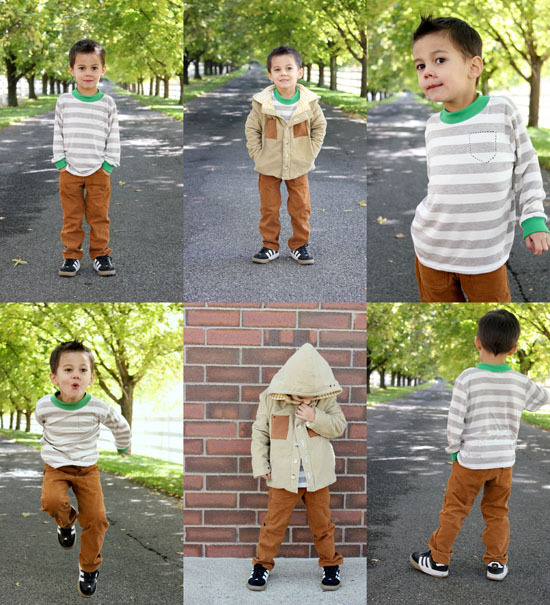 *gray zip up hoodie with matching orange trims, all made from upcycled materials. here in idaho...the kids go to school with their winter clothes on...and come home in shorts and t-shirts. so i knew i wanted a layered look that you could wear for warmth..and easily remove pieces as the sun thaws us out..
i used all the scraps to make a bunch of bow ties. cause boys are so cute with them! and it easily goes from casual to dressy. mix and match. from preppy to punk. Nope. Can't do it. They're all insanely good. Have fun picking a winner...because I certainly can't. I've always wondered - are the designers allowed to use patterns or do they have to draft everything they make? Does every element of the outfit have to be handmade? I am so impressed every week! They all look fantastic! But I'm a math teacher.. I just HAVE to vote for the mathlete, sorry. Awesome. And I love that it's all super wearable, not too cutesy, but not too hip or mod either. Great job to everybody! Now to go read the details on all the blogs... Wow. Great job everyone! I love it when boy's week comes around. 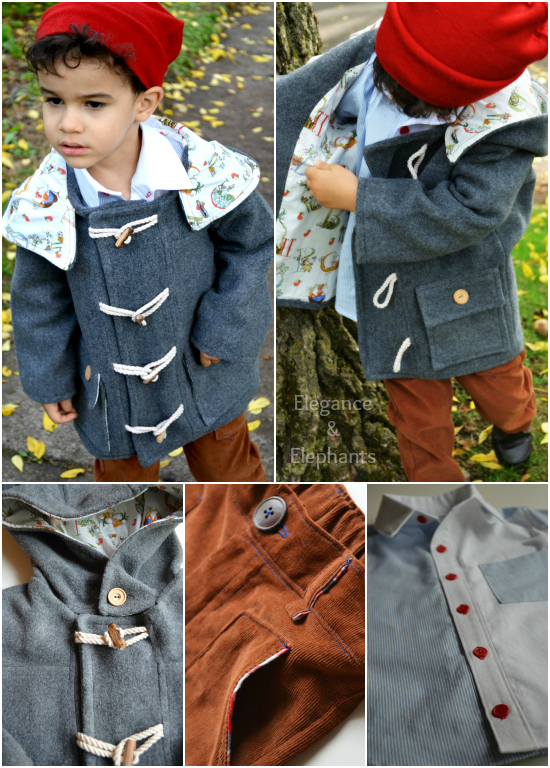 Gives me some ideas for the little man. Such a great job! Loved Delia Creates and A Girl with a Glue Gun...it was so hard to pick! You want me to vote on this? That is impossible. These are all incredible, there simply is no choosing!!! wow girls! they are all AMAZING! i have no clue who to vote for! This is the toughest one for me to decide yet! I think they are all terrific! That said, I have to say Hayley was the most unique. She did such a great job for her sweet son Ethan! Blushing:) Thanks Delia! I agree, though… everyone did such an amazing job this week! They are all incredible outfits, it's so difficult to choose. oh my gosh, how does anyone choose from these!??! They are all AMAZING! What?? This is crazy! I think we need to have a "nobody should go home this week" week! These are amazing! Man, I love them all!! Serious talent these ladies have! This makes me wish that my "boys" (24 and 28!) weren't all grown up. 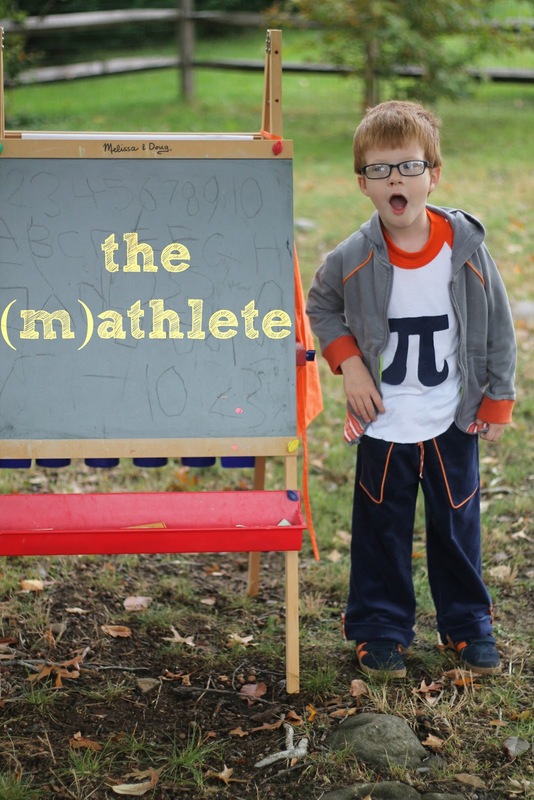 I love them all so much but since I do love a handsome geek, I have to go with the Mathlete! holy crap! who knew boys could be sooo fun!!!! great job everyone! They're all amazing, as they are every week! This is probably going to make me really unpopular... But I think it's unfair that the voting shows how many votes for each look. It totally takes away the element of surprise on Monday. I always used to follow pr&p on my iPhone so could never see the votes and Monday's were always really fun and exciting to see who had won. Wow! 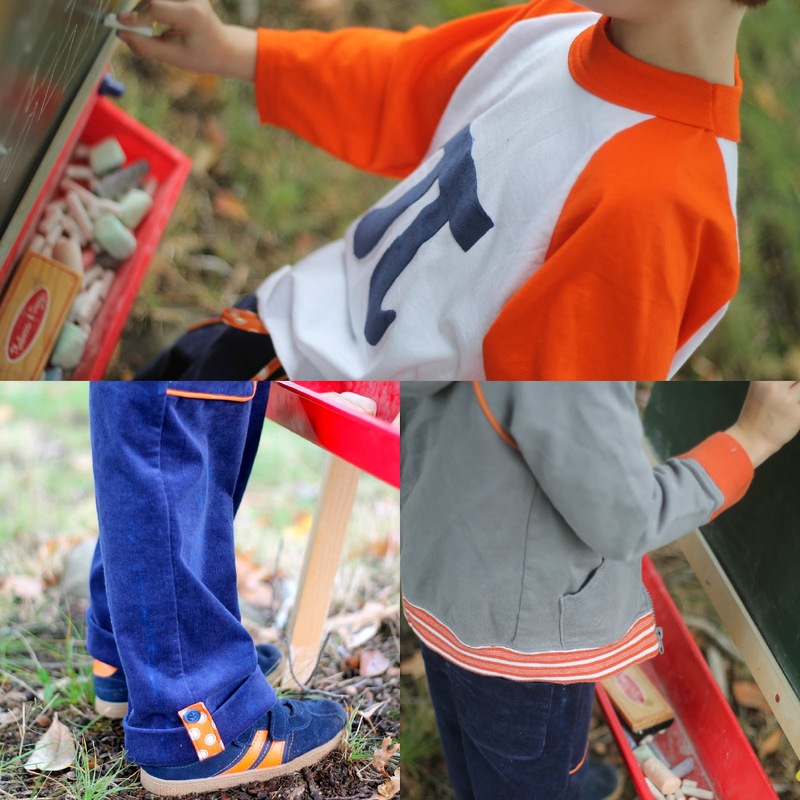 This has inspired me to work on some more things for my boys! GREAT work! As the momma of a boy can I just say WOW! It is so hard to find boy things. These are all wonderful. I can't believe some one has to go! 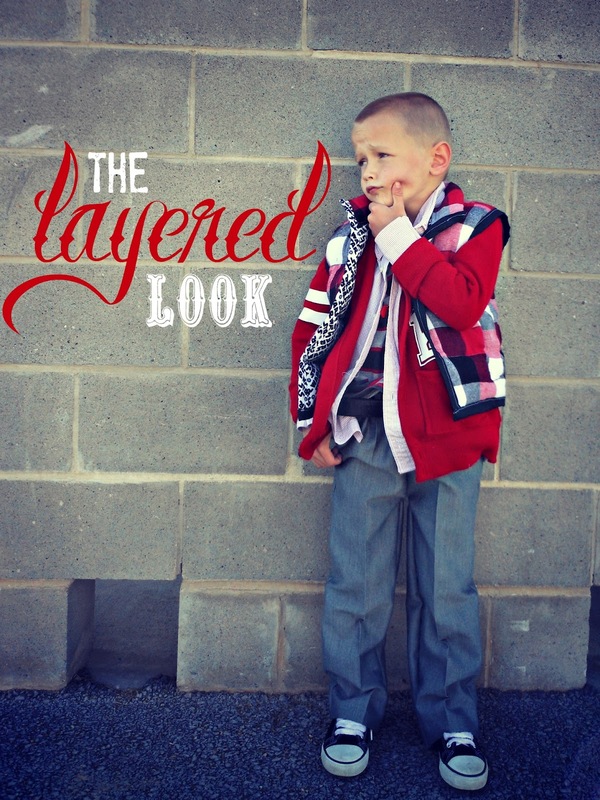 I vote for "the Layered Look" love the red, white & blue!!! 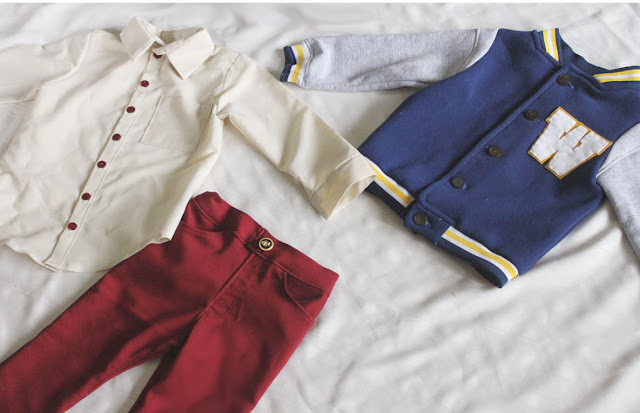 I have a almost three year old who would look so cute in those clothes!! !